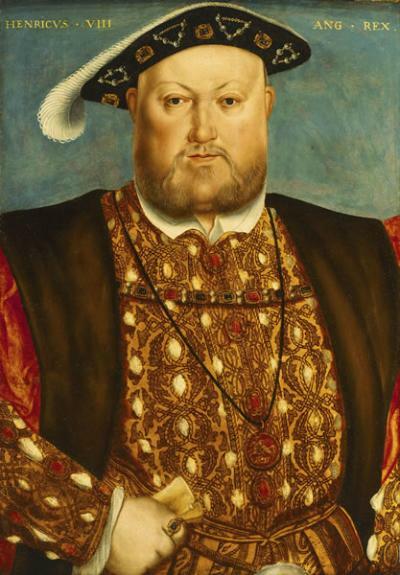 Henry VIII is often remembered as the English monarch who broke with the Roman Church. However, Henry was only attracted to Protestant doctrine in a limited way, as the years 1530-1547 demonstrate. Between the years 1530-1534, Henry tried to get the Pope's permission to divorce Catherine of Aragon, by threatening first the English clergy and then the Pope's powers in England. When the Pope refused to grant the divorce, Henry undertook the most extreme of measures, claiming jurisdiction over the English Church for himself. The Act of Royal Supremacy of 1534 stated that the Crown was reclaiming powers that it had always possessed; powers that Rome had usurped during the previous four hundred years - a fact which Henry and his advisors firmly believed. Yet, by the end of 1534, the English Church was still a Catholic one. Although it was now free of Rome, its religious doctrine hadn't changed at all. There was plenty of debate over the form of doctrine the Church should take, and Henry incorporated some evangelical ideas into his Church. The Dissolution of the Monasteries, for instance, may have been primarily concerned with matters of money and land, but it also swept away a huge and privileged clerical society. This was a very visible attack on the pre-Reformation Church, and the whole task was completed within the four years between 1536-40. In 1536, the Ten Articles were produced as a formulary of the new Church's faith. These articles referred to just three sacraments - baptism, penance and the Eucharist - rather than the usual seven. This was radical at the time, but also confusing, and there was much debate over the 'missing' four sacraments of confirmation, ordination, marriage and last rites. A month later, Thomas Cromwell's Injunctions took a moderate stand against images in churches and against pilgrimages, and it also banned some holy days and saints' days. The issue of transubstantiation was not specifically mentioned, and the Lutheran concept of justification by faith alone was watered down. Therefore, the official religion of England did not condemn the Mass and it did not condemn the Catholic call for good works; but emphasis was laid upon the words of the Scriptures and upon the merits of the simple Christian life. It was a tentative move in an evangelical direction. In 1537, the 'Institution of a Christian Man' was a further attempt at a formulary of faith. It tried to deal with the questions of purgatory and the status of the four missing sacraments in the Ten Articles - which were now found to be lesser sacraments! It emphasised the fact that justification through the merits of Christ didn't dispense with the need for good works. On the issue of transubstantiation the Bishop's Book was adamant that "under the form and figure of bread and wine, which we there presently do see and perceive by outward senses, is verily, substantially, and really contained the very selfsame body and blood of our Saviour Jesus Christ". However a great breakthrough for evangelicals did come in 1537 when royal permission was given for a vernacular version of the Bible. In 1538 Cromwell issued further Injunctions that required that all churches acquire a copy of the English Bible. The central position of scripture in Protestant belief made it vital to make the text available, and an official version gave the English Bible the stamp of approval. Cromwell's Injunctions also took a strong line against images, and centres of pilgrimage. These three years 1536-38 marked the high watermark of officially sanctioned evangelical doctrine under Henry VIII. The King was a keen theologian, and was prepared to incorporate evangelical ideas into his new Church where he saw fit. But he wasn't comfortable with the alterations, and from 1539 onwards he reversed most of his previous policies. In 1539 the Act of Six Articles returned the Church to unambiguous Catholic orthodoxy apart from papal supremacy. Amongst other things, transubstantiation and auricular confession were reaffirmed. Clerical marriage, which had crept in, was condemned, and vows of chastity were now held to be unbreakable. This was an embarrassment to the Archbishop of Canterbury, Thomas Cranmer, whose marriage was an open secret at the time. More significantly, under this act heresy again became a felony. This was a clear signal that Henry VIII wouldn't tolerate those with radical religious views. Henry tried to establish a consensus between Protestants and conservatives. Protestants were punished for violating the Six Articles, while papists were punished for denying the royal supremacy. Until Henry's death in 1547, the Act of Six Articles remained the basis of the Church's faith. In 1543, 'A Necessary Doctrine & Erudition for any Christian Man' came down entirely on the side of traditional orthodoxy, and merely replaced the papal supremacy with the king's authority. Any traces of Lutheranism that were present in the Book of 1537 'Institution of a Christian Man' had now disappeared. Although the English Bible was retained, access to it was severely restricted by the Act for the Advancement of True Religion in 1543. This allowed only upper class men & women to read the Bible, with such women only allowed to read it in private. Henry VIII had dallied with Protestant ideas, but ultimately he proved to be conservative on matters of religious doctrine. It would take his son, Edward VI, and his advisors, to turn England into something more like a genuine Protestant country.